In the digital age we find ourselves in, there’s no shortage of options when it comes to transferring and moving money around. When you can choose to safely send money from one party to another using anything from banking apps to online third-party services to delivery-by-stagecoach (okay, maybe not that last one…at least not within the last century! ), the choices can seem nearly endless. That said, email transfers and electronic funds transfers (EFTs) have proven to be the two preferred frontrunners by the large majority of condo boards – which is why we’re here to break down these two money-handling methods to help you determine which one’s best for your building. Email Transfers: Like Sending Email, but With Money! PRO: Familiar and easy to navigate. If you plopped the average condo owner down in front of a computer, chances are they’d be able to fire off an email with little to no instruction. This is a winning feature of email transactions: they’re easy. Soooooo easy. If you can send an email, you can send an email transfer. CON: Security is a real concern. Email transfers are only as safe as email itself – which is to say, there’s definitely something there to be desired. First, the transfer itself is only as secure as the receiving individual’s email account. Of course, there is password protection associated with each individual transfer, but these are often pretty elementary in terms of complexity, and can be usually be easily guessed, after which that money is there for the taking. PRO…and CON: Very economical. One of the reasons people are so quick to transfer money via email is that there is often only a very small fee associated with each transaction – if there’s any fee at all. However, for a business like a condo corporation that frequently moves funds around, this fee can quickly add up, making this “economical solution” become a money pit. CON: Limited number of transactions. Most banks only allow a certain number of transfers per 24-hour period..
CON: This isn’t really what email transfers were designed for. Unfortunately, part of the reason that email transfers are so user-friendly and accessible is because they have always been much more geared towards personal use, as opposed to the more business-oriented dealings that condo boards generally require. The verdict, in our humble opinion? Email transfers are great for their accessibility and low-cost service options, but your board might find that this particular platform for financial transfers ends up buckling under the weight of your condo corporation’s fiscal dealings. PRO: Super-quick payment timelines. With EFTs, there’s no waiting on password entries, email servers, or the like. After the payment is made, it immediately lands in the recipient’s account – no fuss, no muss. Your vendors will be able to receive payments quicker and on a more consistent basis, which we’re sure they’ll appreciate. CON: Costs can be an issue. While email transfers are either free or so cheap that they may as well be free, EFTs typically require a fee for each individual transfer, and also usually tack on a minimum charge every time your board does a pay run. Ouch. PRO: You still might end up saving money. Even though EFTs are costlier than email transfers, there’s actually a good possibility that you could end up saving money over your current methods of doing business, depending on what they are. If your condo board kicks it old-school and still relies on a chequebook to make payments, you can easily coordinate your EFTs so that your condo gets the most bang for its buck every month, eventually coming in better than it did having to pay for cheques, envelopes, postage, etc. PRO: Much more secure than email transfers or cheque payments. There. Now it’s a “pro.” Much better! PRO: EFTs are environmentally friendly. This doesn’t really give EFTs much of a leg-up on email transfers, as both forms of payment are electronic and paper-free, but again, if your condo corporation is still relying on good ol’ fashioned cheques to pay the bills, you can bet everyone – residents, vendors, and board members alike – will be happy to see your condo go green. 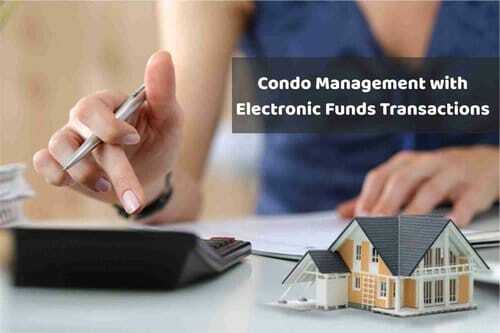 While email transfers are fine, we have to fall on the side of increased security and financial protection, and ultimately recommend that if your condo board is looking to change the way it handles its finances, EFTs are the way to go. Not only are these transactions much more secure than cheques or email transfers, but the entire EFT system is just better-equipped to handle the transactions and rigors your condo board will throw at it. If you’re interested in making the switch to EFTs but don’t know where to start, give us a call at Catalyst Condo Management – we’ve walked plenty of condo boards through the process, and would be happy to do the same for yours!